Greetings all. 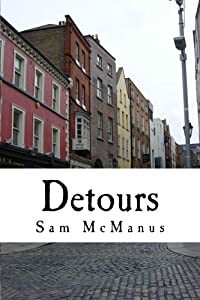 I have decided to ePublish my first novel, Detours, on amazon.com, through their Kindle Direct Publishing. It is also recently available in paperback format, so you can choose which one you would like to purchase. I am very excited to share this tale with you, one that is very near and dear to my heart. While it isn’t the first novel I’ve written, it is the one that has been my labor of love over the course of the past five years. Synopsis: What would you do if you could live three lifetimes at once? For Andre Winters, this is a reality. Detours is the story of one man with real problems, struggling to identify himself through the relationships he forms with women, and ultimately finding a sense of solace. Taking place over the course of twenty-one years and three cities, it is the ultimate journey of self-discovery. Haven’t you ever wanted to take a detour? How can I download this to kindle? Or is that even possible? Yes, you can download it. Just click on the link. This sounds really cool. I’ll have to check this out.